Here's a question: when is a sat-nav device not a sat-nav device? When it's a UMPC housing applications for YouTube, MySpace, with the ability for media playback that just happens to have GPS and real-time traffic reports. That's when. 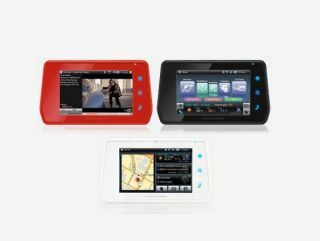 The Clarion MiND has all the bells and whistles it possibly could to make its in-car UMPC stand out from the crowd. Underneath the hood of the Clarion MiND is 4GB SSD, 512MB of RAM and Wi-Fi/3G/Bluetooth 2.0+. On the surface is a 4.8in screen, with the device coming in a choice of three colours: red, black and white. Extra connectivity comes in the form of a pair of USB ports, while memory can be boosted via the MicroSD card slot. Battery life is pretty poor at just two hours, but you can boost this by adding an extended cell battery pack. The device will be out in the States this November. Those residing in Europe will have to wait until January, when the Clarion MiND will cost 649.99 Euros (around £520).